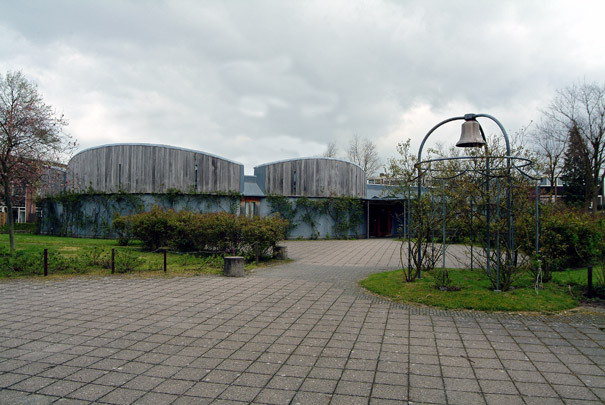 In designing this church for the Moluccan community Van Eyck sought a building that was in no way isolated from its surroundings. He did away with the difference between inside and outside by several means. To begin with, the containing outer walls are overgrown with climbing roses so that the church melts into the garden. Between the two principal volumes, the main space and a part combining a meeting room and the vestries, is an internal street with an entrance at each end. The main church space has a square plan whose four corners are localized by apses of different sizes. As a result the unambiguous axiality of the traditional church makes way here for a multi-axial system of local symmetries. The billowing apses are clad on the outside with untreated iroko wood; a flat roof held aloft on a network of round concrete columns marks out the original square. The internal partitions are painted in blue bands that descend from light to dark, decorated by the artist Iene Ambar with sweeping lines of shells found off the Moluccas. Given the blue of the billowing walls and their exposure to daylight, the impression one gets is of worshipping beneath a flat roof in the open air.